GENEVA, Nov 21 2013 (IPS) - Amidst rising expectations of a breakthrough, Iran and six world powers Wednesday resumed their quest for a deal on Iran’s controversial nuclear programme that seemed just within reach earlier this month. In the first of at least three days of talks here, diplomats from Iran and the so-called P5+1 (U.S., Britain, France, Russia, China plus Germany) held a series of plenary and bilateral sessions which failed to clarify whether the issues that prevented an accord less than two weeks ago had been resolved. While a source close to the Iranian delegation suggested that disagreements among the P5+1, notably between France and the other major powers, persisted, a senior U.S. official told reporters that the group was united. “There is quite a lot of misinformation out there,” according to the official. “A lot of progress was made, but differences remain,” said EU Spokesperson Michael Mann late Wednesday, repeating the formulation offered by EU Foreign Policy chief Catherine Ashton and Iran’s Foreign Minister Mohammad Javad Zarif Nov. 9 when the last round of talks broke up. While participants involved in the talks have been mostly tight-lipped on the details of their discussions, the deal on the table – an interim agreement pending a comprehensive accord to be completed within six months to a year — involves reciprocal moves by both sides. Among other steps, Iran would reportedly be required to freeze its production of 20-percent enriched uranium and put its existing stockpile under strict monitoring by the International Atomic Energy Agency (IAEA) pending its conversion into oxide; limit all of its enrichment to not more than 3.5 percent; and delay fueling its yet-to-be-completed Arak heavy-water facility, which is designed to produce plutonium for its nuclear industry. In return, Iran would receive what U.S. officials have called “limited but reversible” relief from sanctions on its trade in petrochemicals and precious metals, and access to as much as 10 billion dollars of its foreign exchange reserves that are currently frozen in Western bank accounts. “The proposed deal is in America’s national interest and would improve security for the U.S. and its regional allies,” Jim Walsh, an international security expert at MIT, told IPS. “The primary concern of nonproliferation experts is the threat posed by 20-percent enrichment, and this deal ends that,” said Walsh. The tone expressed by a senior administration official at the conclusion of Wednesday’s negotiating session was more subdued than that expressed by U.S. diplomats during the last round of talks two weeks ago. The point of this session is “getting back to work…shutting out the noise, getting into the nitty-gritty of a first-step agreement and the parameters of a comprehensive agreement and seeing if we can narrow the gaps to conclude such an agreement,” the official said. A meeting of political directors from the P5+1, that included an experts’ discussion Wednesday morning, was followed by a 90-minute bilateral discussion between Ashton and Zarif. In the evening, a brief plenary session was reportedly followed by separate bilateral meetings between Iran and Russia, China, and the three European countries. The Iranian and U.S. delegations will hold yet another bilateral meeting Thursday, in addition to the plenary sessions. In a televised speech to members of Iran’s paramilitary Basij force earlier Wednesday, Iran’s Supreme Leader, Ayatollah Ali Khamenei reiterated his support for Tehran’s negotiating team and pledged not to intervene in the talks so long as it does not violate “certain red lines and limits” – an apparent reference to Iran’s insistence that it has the right to enrich uranium for peaceful purposes as a signatory to the Nuclear Non-Proliferation Treaty (NPT). “We want to have relations with all people,” Khamenei said. “Even with the American people we do not have enmities, we have a problem with the U.S. government and its arrogance,” he said in an otherwise militant speech in which he strongly denounced Israel as “the rabid dog of the region” and France for allegedly doing Israel’s bidding in the P5+1. Earlier this month, France broke with its P5+1 counterparts by publicly expressing its opposition to the language of a draft accord reportedly negotiated between Secretary of State John Kerry, Ashton and Zarif. French Foreign Minister Laurent Fabius complained in particular about provisions regarding Iran’s continuing uranium enrichment and what he suggested were insufficient constraints on the ongoing construction at Arak. “Do I believe this issue can be navigated in an agreement? Yes I do, and we will see what can be done,” said the official. For its part, Iran indicated earlier this week that an explicit recognition by the P5+1 of Iran’s “right to enrich” was not necessary. 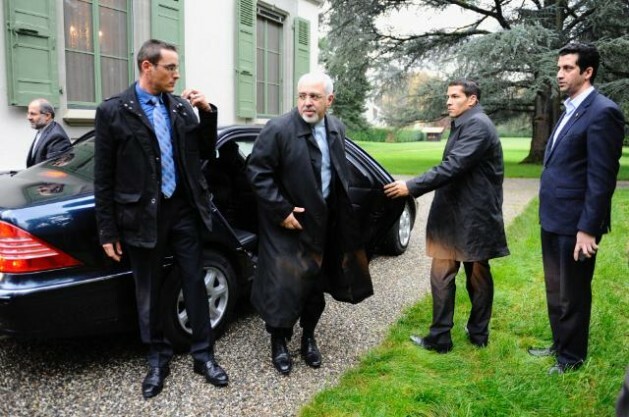 “Iran’s enrichment right does not need recognition, because it is an inseparable right based on the NPT,” Zarif said. “What we expect is respecting parts of this right,” he said, according to the Iranian Student News Agency. Israeli Prime Minister Benjamin Netanyahu, who has repeatedly denounced the pending interim accord as a “very bad deal,” has insisted that Iran should not be granted any sanctions relief until it halts all enrichment and dismantles other key parts of its nuclear programme. He has also called for more sanctions to achieve that result. His demands have been backed by Israel lobby groups in Washington and some Republican lawmakers who this week called for more sanctions against Tehran and tried to have Netanyahu’s demands added to a pending defence bill just as the Geneva talks got underway. Prodded by the White House, however, the Democratic leadership in the Senate appears to have put off debate on the proposed amendment at least until Congress returns from its Thanksgiving recess Dec. 9, thus giving the administration more time to conclude an accord with Tehran. The administration, whose exasperation with Netanyahu’s lobbying and Republican backing for the Israeli leader has become increasingly apparent over the last few days, was bolstered Wednesday by a Washington Post/ABC poll that found nearly two-thirds of respondents in favour of easing sanctions in order to get a deal with Iran. In addition, former Secretary of State Madeleine Albright signed on to a letter sent Monday by former national security advisers Brent Scowcroft and Zbigniew Brzezinski that offered strong support for Obama’s negotiating strategy. Still, failure to get a seal an interim accord within the next couple of weeks will almost certainly strengthen hard-line forces in both Tehran and Washington, according to most observers. “[T]he body language of the two sides suggests that they are ready to secure a meaningful agreement on the basis of realistic and achievable goals,” Ali Vaez, an Iran expert the International Crisis Group, told IPS. “While more promising than ever, nuclear diplomacy with Iran remains fragile and could well founder,” he added. “Should that occur, it would be hard to recreate these favourable circumstances; indeed, the more likely path would be continuation of the trajectory witnessed over the past decade: heightened sanctions, accelerated Iranian advances on the nuclear front and greater probability of armed confrontation,” said Vaez. Jim Lobe contributed to this article from Washington.